On Tuesday 16 October 2018, upon invitation from the Albanian authorities, H.S.H. 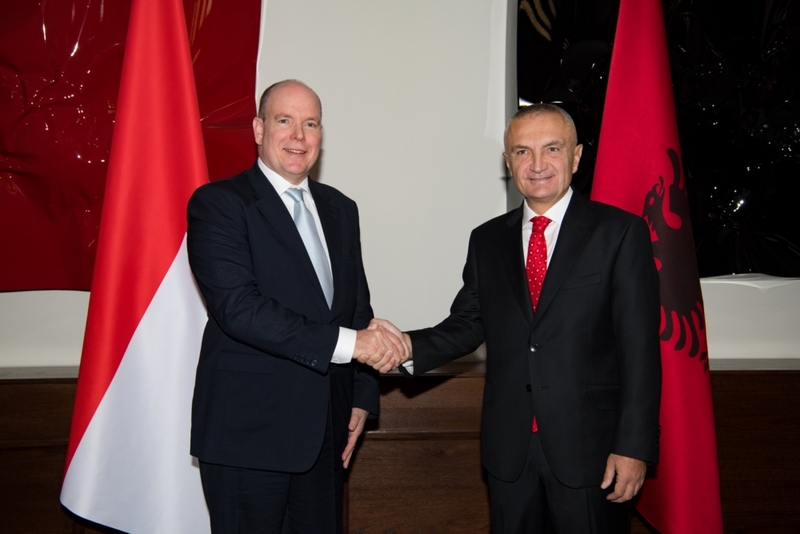 Prince Albert II of Monaco travelled to the Albanian capital of Tirana for his official visit to the Land of the Eagles. The Sovereign Prince arrived at the Presidential Palace in the late morning, where Mr Ilir Meta, the President of Albania, invited him to attend a working meeting held with the Albanian Ministers for Foreign Affairs, Tourism and the Environment. A Memorandum of Understanding (MoU) was signed by Mr Gilles Tonelli, Adviser to the Monegasque Government for External Relations and Cooperation in his capacity as the official representative of the Monegasque government, and Mr Ditmir Bushati, Minister for Europe and Foreign Affairs, representing the Albanian government. This MoU shall serve to strengthen cooperation between the two companies in economic, political, scientific and environmental matters. Following this first meeting, the Sovereign Prince met with representatives of Flag Pine, an Albanian NGO that works to safeguard the environment and campaign for the development of marine protected areas. Mr Bernard Fautrier, Vice-President of the Prince Albert II Foundation and Mr Saimir Brahimi, President of Flag Pine, signed a partnership between the two bodies. At around 1pm, a working lunch was hosted by Prime Minister Mr Edi Rama, attended by the Minister for Culture Ms Mirela Kumabaro, the Minister for Tourism and the Environment Mr Blendi Klosi and Mr Dritan Tola, Albania's ambassador to France and Monaco. H.S.H. the Prince then ventured into the foothills of Tirana to lay down a floral arrangement at the foot of the Mother Albania statue, a monument dedicated to the glory of fallen Albanian heroes. The Sovereign Prince then travelled to Tirana's city hall, where he met with the city's young, energetic mayor Mr Erion Veliaj, who introduced him to the capital and presented him with the 'keys to the city'. After the ceremony, the Prince travelled to the Residence of Prince Leka II, the Crown Prince of Albania. The two men spent an hour in private discussion. The day ended with an official dinner hosted by President Meta at the Palace of Brigades, where the President awarded the Prince the National Flag Order medal, the highest distinction in the country.